Whew! 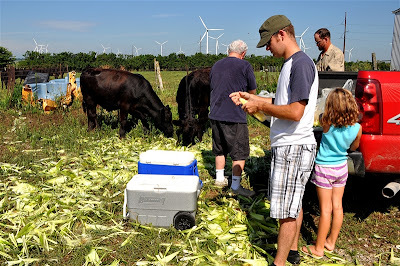 Last weekend we had a family gathering to freeze corn. What I like most about this is the chance to pass down a family lesson and mingle with 3 and 1/2 generations (my niece is due in November!). Mom, Dad, Tall Guy, the girls and I put up about 9 doz. ears a few days before, so we calculated that we would need about 36 dozen to make everyone's freezers happy. These were 14 ear "dozens," so you can pretty much bet we ended up freezing over 40 dozen ears this day. After the shucking is done, it's time to start boiling the water. 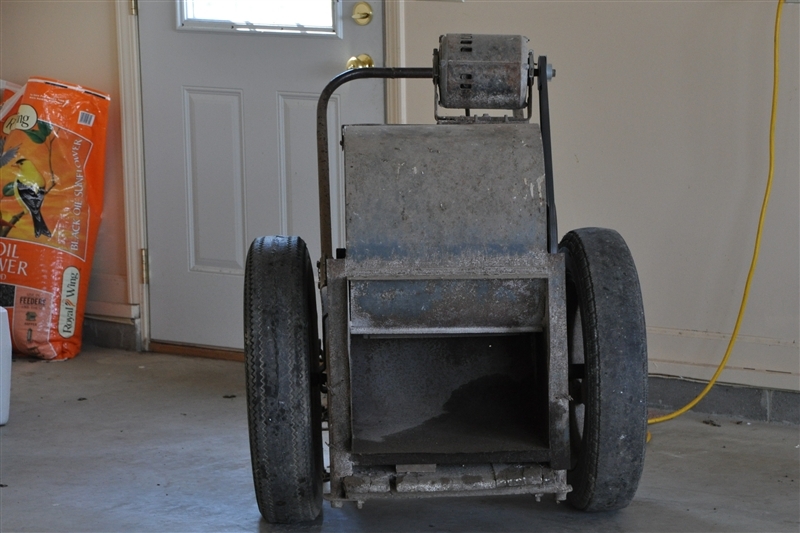 We did this on the porch last year, but now that we have our wonderful new garage, we have a bigger, handier place to work. Rule one around here: Do as much of the corn process outside as we possibly can. 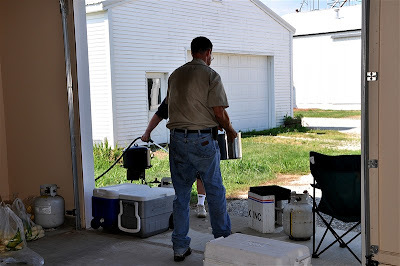 It keeps your kitchen cool, and this year we cut outside too, so it kept most of the mess outside as well! We use any big pots we can find, but the ones you use to fry turkeys in work very well! This is a revamped fan. 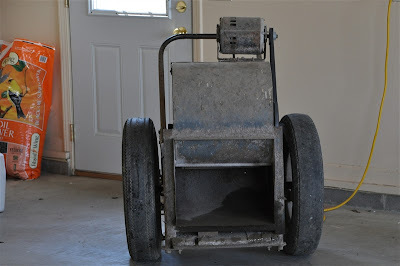 It only has one speed, ON, but it was great for keeping us cool and the flies at bay. After boiling your water, put the corn in and let it stay in the pot for 8 minutes. After the 8 minutes are up (not an exact science but be close around that time), take the corn out of the pans and put them right in to the cooler of ice water to stop the cooking process! 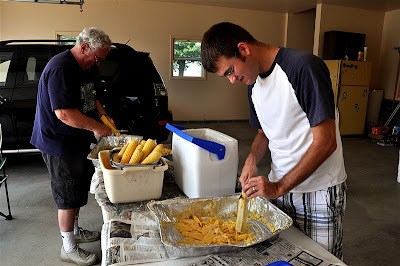 Dad is laughing here because he is demonstrating the "wrong" way to cut corn off the cob, and Arik is showing the OSHA-preferred method. He and I both learned how to cut corn off the cob from his mother and his oldest sister. I cut up on the ear toward me, then run the blade of my knife back down the cob to get out all the hearts, or tastiest parts. It's a process you learn over the years. 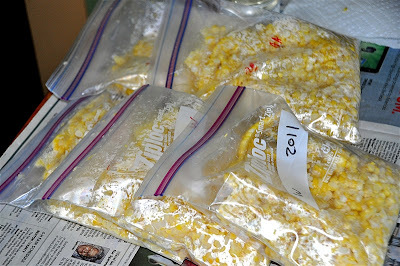 Now it's time to take the corn inside to Mom and the girls to be bagged. My niece started at the cutting table, but ended up at the bagging end because my great-nephew was putting a strain on her back. Totally know what that feels like! See that nice shiner forming under Bear's left eye? She also had a knot the size of a peach pit under her bangs. She is our poster child for the national "DO NOT RUN When You Can Walk" campaign. She was running in the tool shed, tripped, and hit the wooden work bench. Her bangs hid the knot when I found her, but it all got progressively more noticeable as the day went on. She was pretty brave, and we all kept a close eye on her, but she held out pretty good until we were all done. Then she wanted to snuggle with her mommy. And that dear Twin Lakes Class of '91 is why I was unable to be at your reunion. Mommy won out over seeing my older kids! Hugs to you all! Now in the middle of this hoopty-do, we did take a time out to eat, and Bear took center stage again because she was going to eat her corn on the cob minus her two front teeth. It made for an interesting pattern! 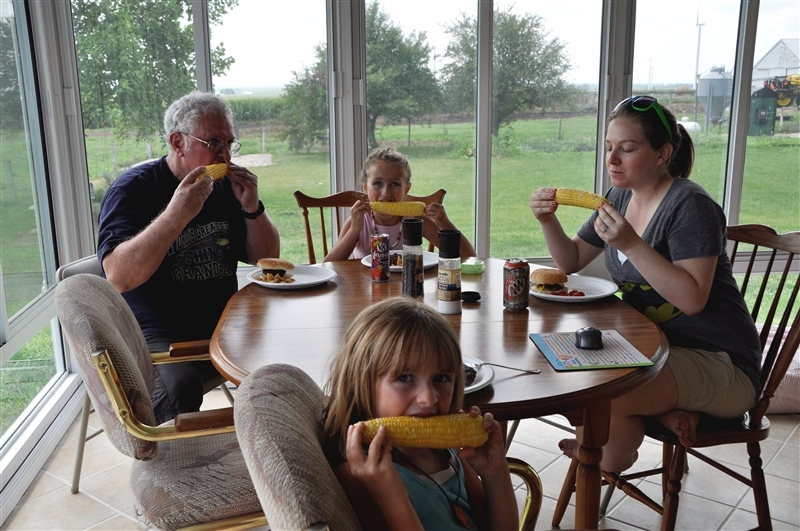 Here is the rest of this shift chowing down on some good corn. The final step to all this work is to freeze the bags of corn. 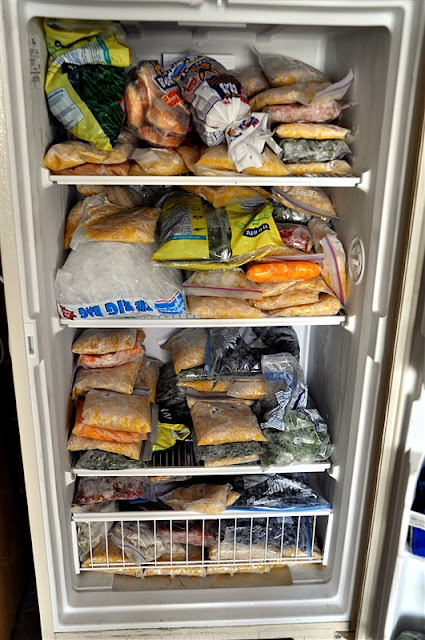 Now don't just pop them in the freezer, especially if you have as many bags as we did. You need to LAYER the unfrozen corn in between items in your freezer that are already frozen. 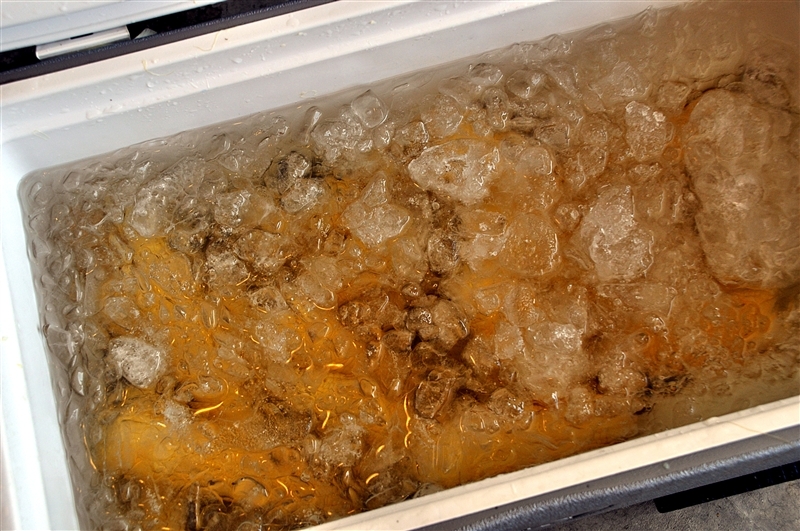 The idea is that a pile of bags of unfrozen food on top of each other will take longer to freeze, and you may run the risk of some bags in the middle only partially freezing before they spoil. Here is our corn mixed in with other goodies. 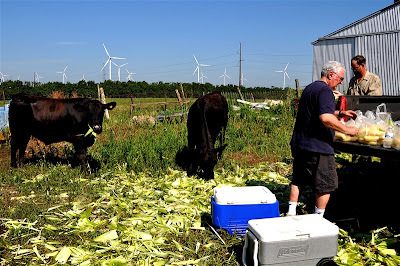 Some corn was already frozen from earlier in the week or years gone by. 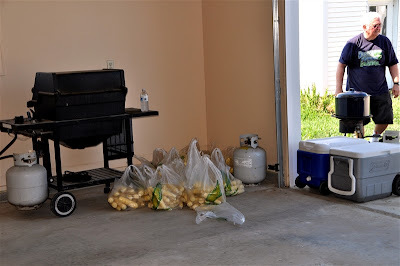 So that is how you freeze corn, or at least this is how we freeze corn. I promise you it is VERY GOOD! YUM! 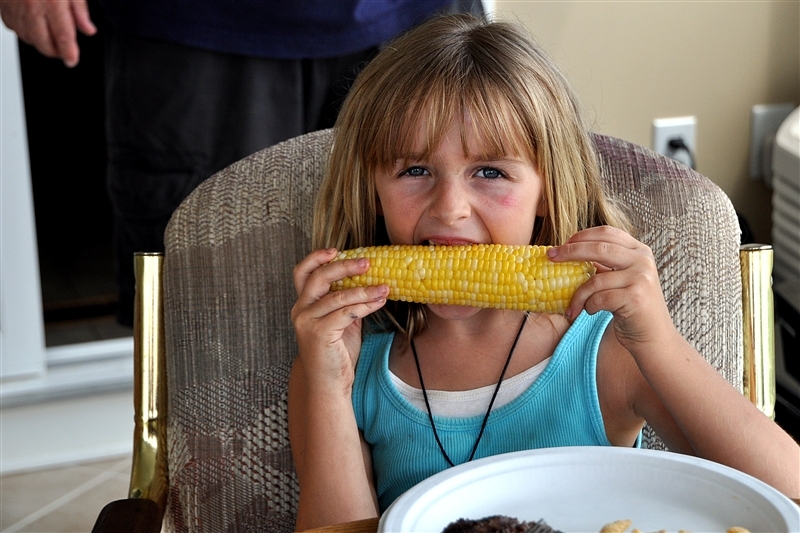 There is nothing better than Indiana Sweet corn that you can pull out of the freezer in the middle of the winter. I've never put it in ice water...I'll have to remember that! 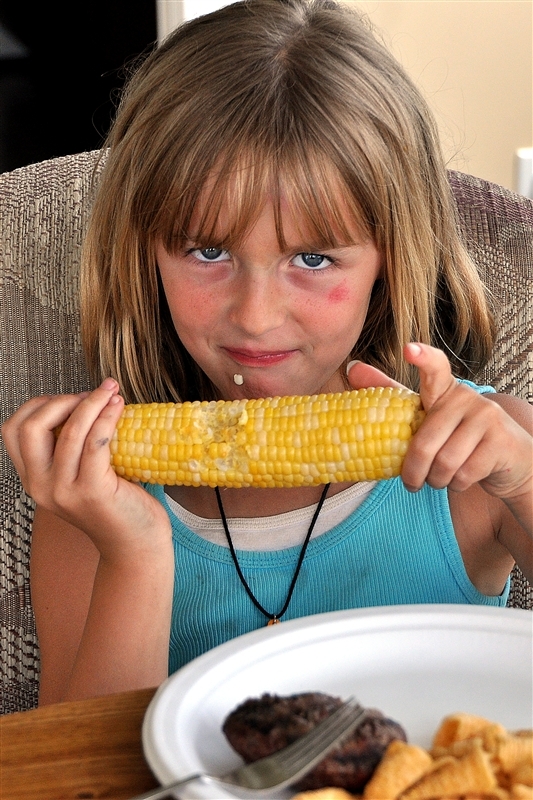 I have put melted butter in the corn before I bagged it though. 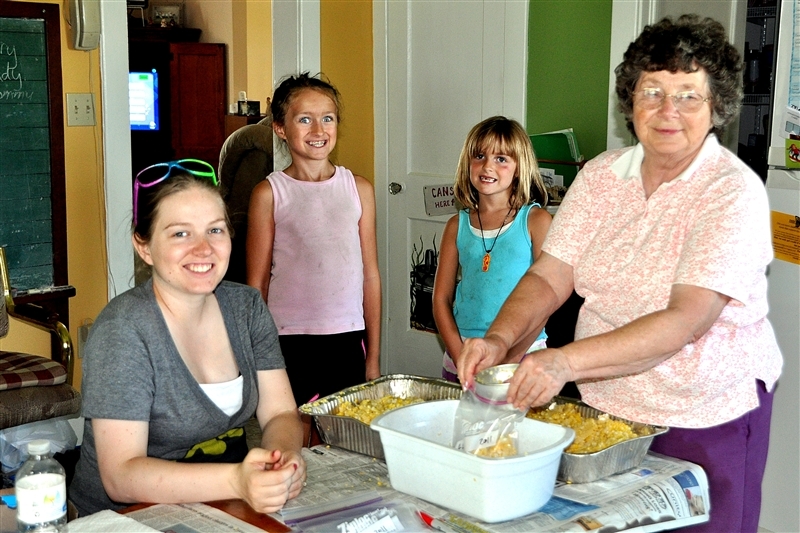 This looks like a lot of work and a lot of fun with family! I'm envious of the help. At best, I get one kitchen helper. Canning and preserving makes the others run! Love that you get a group together to freeze your corn. 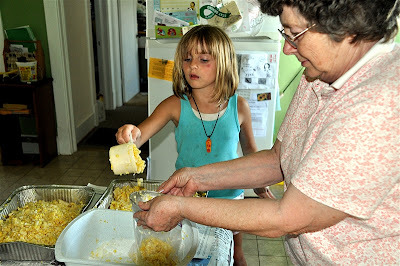 Growing up with did something similar with canning green beans. Those were fun times to think back on and definitely beat me standing in my kitchen alone doing it. It's a family affair, Lana.... What a fun way to freeze a bunch of corn for winter.... Love it!!!!!! 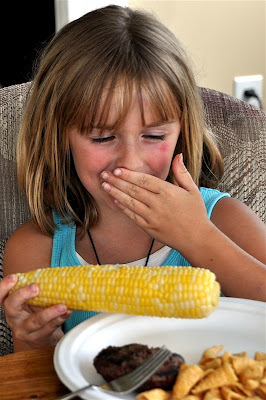 haha woudn't mind coming over and eat some corn with ya! Looking good!!! and great family fun! What a great way to have corn year round! I have been told that you can freeze whole ears (though I'm sure it would do some damage to your storage space! ), but I have no idea if it would work or not. I'd love to give your plan a try, if even on a smaller scale. Yum!